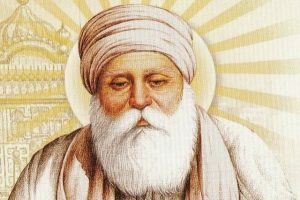 Guru Amar Das is the 3rd of the Sikh Gurus. He lived from 1479 to 1574. Guru Amar Das is said to embody equality and generosity. Das died at the age of 95 on 1 September 1574. Guru Amar Das lifted the status of women and gave them equality with men. Guru Amar Das strictly banned the practice of Sati (the dying of the wife on her husband’s funeral pyre) and „Parrda” (veil to cover the face). Before his death, Guru Amar Das called for Sikh congregation headed by Baba Buddha that was also attended by Guru’s two sons Mohri and Mohan. Guru Amar Das appointed his son-in-law Jetha as successor and renamed him Guru Ram Das. Guru Ram Das, his son-in-law, is the 4th of the Sikh Gurus. He lived from 1534 until 1581. He is said to embody humility, loving service and compassion. Ram signifies „servant of the Lord.” If you ask something of Guru Ram Das he has to bring it to God for you. Let your worries to Guru Ram Das and let him take them to God. The God that rotates the earth can without doubt take care of your problems. „Normally there is no power in the human but the power of prayer. And to do prayer, you have to put your body and mind together and then pray from the soul. Ardas Bahee is a mantra prayer. If you sing it, your body, mind and soul automatically combine and without saying what you want, the need of the life is adjusted. That is the beauty of this mantra prayer.” – Yogi Bhajan’s quote. This entry was posted in Kundalini Mantras on March 4, 2016 by admin.